In this post, we will compare SoftMaker Office Professional 2018 with Microsoft Office Home & Business 2019 and Microsoft Office 365 Business and help you decide which one is actually more cost-effective for your small business needs. We use 10 user license options in this calculation, but be aware that SoftMaker Office 2018 Professional is also available for 5 users or 1 user, and each license can be added to each other (e.g. 20 users company can purchase two 10 user licenses). BinaryNow also offers custom volume licensing for organizations with 50+ computers, just ask for a quote here. SoftMaker Office Professional 2018 and Microsoft Office Home & Business 2019 are per-PC one-time purchase. This means you will pay upfront and you can use software as long as you like it. 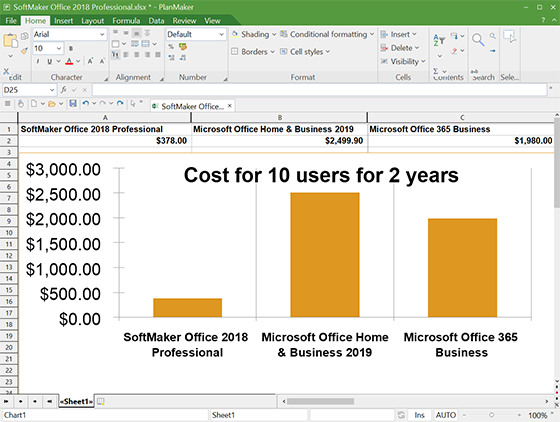 Price for 10 user license for SoftMaker Office Professional 2018 is $378* and price for Microsoft Office Home & Business 2019 is $2,499.90* ($249.99 per user). Your saving with Softmaker Office Professional 2018 is $2,121.90*. Microsoft Office 365 is a per-user subscription. You can install the Microsoft Office 2016 apps like you would normally, but you have to pay monthly or annual fee to use it. For the comparison, we’ll be using the cheaper year-to-year subscription plan instead of the month-to-month plan because there are not many situations where you would only need Office for a month. Annual subscription for 10 users for Microsoft Office 365 Business is $990.00* ($8.25/month/user). Your saving with SoftMaker Office Professional 2018 is $612 during a first year and $990* for each year after. SoftMaker Office Professional 2018 is not only more cost effective for a small organization, but it also uses the Microsoft formats DOCX, XLSX and PPTX as its default file formats to skip the annoying import and export. Includes TextMaker, PlanMaker, Presentations and integration with Thunderbird email client. 30 days free trial is available, so give it a try. Microsoft Office 2019 price increase alert!